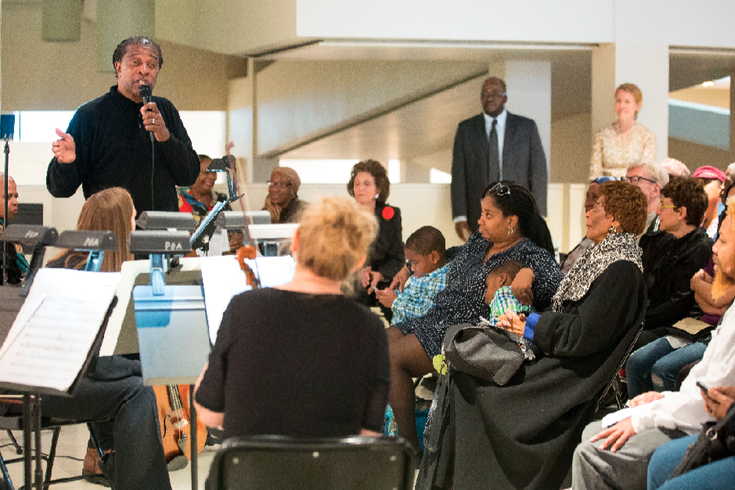 Hannibal Lokumbe speaks to members of the Philadelphia Orchestra. Midway through our phone conversation last week, Hannibal Lokumbe excused himself briefly to pour a glass of water. “This stuff is very emotional, man,” he said by way of (unnecessary) apology. Beyond the mere fact that the nearly two-year process of envisioning and composing Lokumbe’s “Crucifixion Revolution: Nine Souls a Traveling” will finally come to fruition this weekend, Lokumbe’s emotions are understandable given the subject of the piece. This Saturday marks the two-year anniversary of the mass shooting at Emanuel African Methodist Church that killed nine people, and Lokumbe’s “Crucifixion Resurrection" pays tribute to the victims while linking the tragedy to other acts of racial violence at American houses of worship. “Crucifixion Resurrection” is a composition for Hannibal Lokumbe’s trumpet, jazz trio, a chamber ensemble featuring Philadelphia Orchestra Associate Concertmaster Juliette Kang on violin, choir and vocalists. “Crucifixion Resurrection” is a composition for Lokumbe’s trumpet, jazz trio, a chamber ensemble featuring Philadelphia Orchestra Associate Concertmaster Juliette Kang on violin, choir and vocalists. The composition finds the nine victims ushered into the afterlife by four “scribes” who turn out to be the spirits of the four young girls killed in the 1963 Birmingham church bombing. 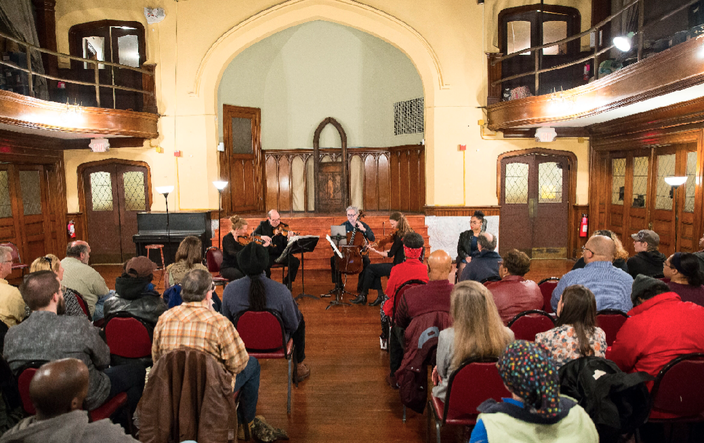 The concert itself, which takes place on Saturday night at Mother Bethel AME, will be the culmination of a full weekend of events centered around the piece. On Thursday, the Painted Bride will open an exhibition entitled “Hannibal Lokumbe: The Unveiling of the Saints,” for which visual artists Steve Prince has created nine banners in the shape of Emanuel AME’s stained glass windows that depict the shooting victims as saints. The next night, one of the survivors of the Birmingham bombing, Sarah Collins Rudolph, will join a panel of civil rights experts for a discussion at the National Constitution Center. Finally, Saturday’s concert will be preceded by a “walk of love” from Weccacoe Park to Mother Bethel, with participants hoisting Prince’s banners en route. Hannibal Lokumbe has a three-year residency with the Philadelphia Orchestra. The church has traditionally set a high bar for sainthood, but Lokumbe is confident that the nine Charlestonians meet those criteria – including the performing of two miracles. One of them, he explains, was being killed in a house of worship; the other came when their survivors forgave their murderer, Dylann Roof. “How can there be a greater miracle than forgiving the person who crucified you?” Lokumbe asked. It’s like a slow growing river oak. It’s like that with all of my work, but this one in particular because I can sense that the pain and suffering of people in this land are growing faster than the polar caps are melting." 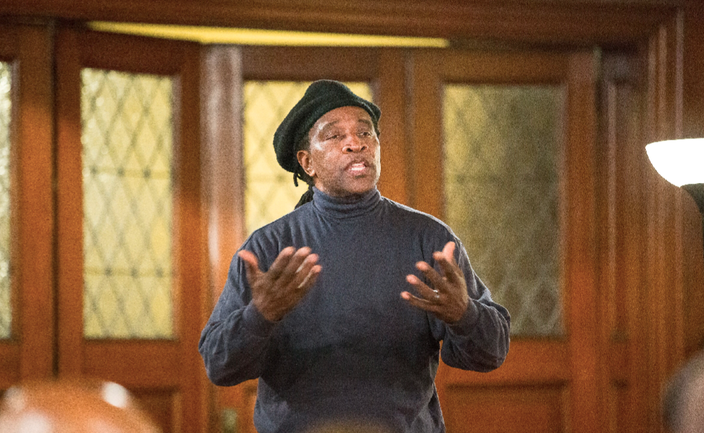 “Crucifixion Resurrection” is just one part of Lokumbe’s three-year residency with the Philadelphia Orchestra, which will eventually lead to a new “hymn for the city” called “Healing Tones” to be premiered in the 2018-19 season. While the residency kicked off last December, Lokumbe says that “the love affair has been going on for quite a number of years,” since the Orchestra performed his oratorio, “African Portraits,” in 1997. Based in his native Texas, Lokumbe has long blurred the lines between jazz and classical music, which he insists “come from the exact same spring.” While having three years to immerse himself in the community in and around Philly is a luxury, he says that all of his music is born from a similarly gradual evolution.